Where did it all start for Leeds United? Worldwide icon-chevron-right Europe icon-chevron-right United Kingdom icon-chevron-right England icon-chevron-right Leeds icon-chevron-right Where did it all start for Leeds United? If you want to learn about Leeds United’s history by visiting physical monuments to their 96-year existence, there is only one building in the city of Leeds of any major significance other than that battle-worn place of worship on Elland Road, LS11. 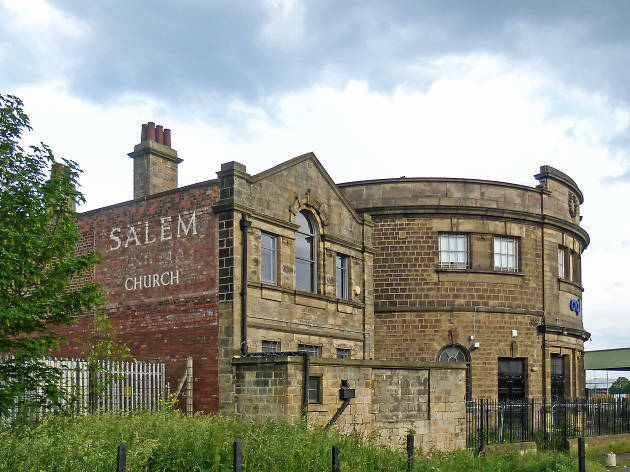 That building is the Salem Chapel in Hunslet, just along from the Adelphi pub. Opened in 1791, this grade-ll listed church and hall is the oldest surviving non-conformist chapel in Leeds. Its distinctive curved façade was added in 1906, but even further before Leeds United’s existence the building was a central communal feature, standing as it does along from Leeds Bridge which was once the principal gateway to the city from the south. 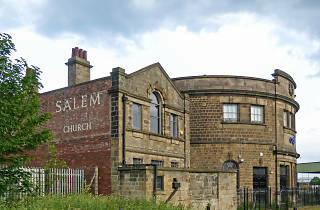 With the industrialisation of the 19th century, the chapel became a focal point for the Hunslet working classes, hosting weddings, christenings and Sunday school classes. As the adjacent Tetley’s Brewery expanded at this time, it's said they utilised a well under the chapel building to draw water for their brewing process. The building’s critical role in the formation of Leeds United came on October 17 1919. Leeds City – themselves formed in the nearby Griffin Hotel (now the Griffin Pub) on Boar Lane in 1904 – had been wound up following the discovery of financial irregularities by the Football League, and an auction was held at the Metropole Hotel, where players, kit and equipment were sold to the highest bidder in a humiliating spectacle. Stung by this sorry episode, around 1,000 Leeds City fans congregated on the same day at a public meeting in the hall of the Salem Chapel. Chaired by a local solicitor, Alf Masser, the meeting voted unanimously to form a new professional football club. The name Leeds Trinity was discussed but Leeds United was agreed. Leeds United’s fortunes from there are well documented, but not so much the story of the place that gave birth to it. The post-war slum clearance contributed to the chapel’s congregation slowly dwindling and it became utilised more as a refuge for the homeless and unemployed. The building eventually closed as a place of worship in 2001 and stood empty and derelict until a successful Leeds businessman gave the building a new lease of life in 2009. Adam Beaumont’s telecommunications business AQL bought the building and immediately stated their intention to lovingly retain its beauty while celebrating its architectural and civic significance. It was awarded blue-plaque status in November 2011. Today, the atmospheric hall is a hi-tech 360-seat conference room but, like so many of Leeds' lovingly restored buildings, no structural changes have been made. Given there's nothing at Elland Road that dates back to the club’s 1919 formation, we should be thankful that Leeds United’s birthplace can still be both seen in the city, and fittingly revered. Read about Peanut's love of Leeds United.